Bleeding Gums don’t matter right? What if every time you brushed your hair there was blood on the hairbrush; most of us would be running to the doctor faster than we’ve ever run before. 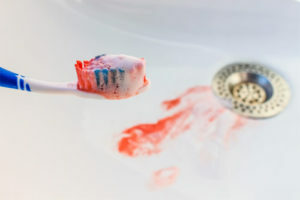 Bleeding Gums are an indication of local infection, called gingivitis. Left untreated the infection can spread into the jaw bone around the teeth (a disease called periodontitis) causing wobbly, sensitive and painful teeth. The good news is bleeding gums are easy to treat. Bleeding Gums (periodontitis) can be a serious health concern in people with diabetes, heart disease and other chronic disease.